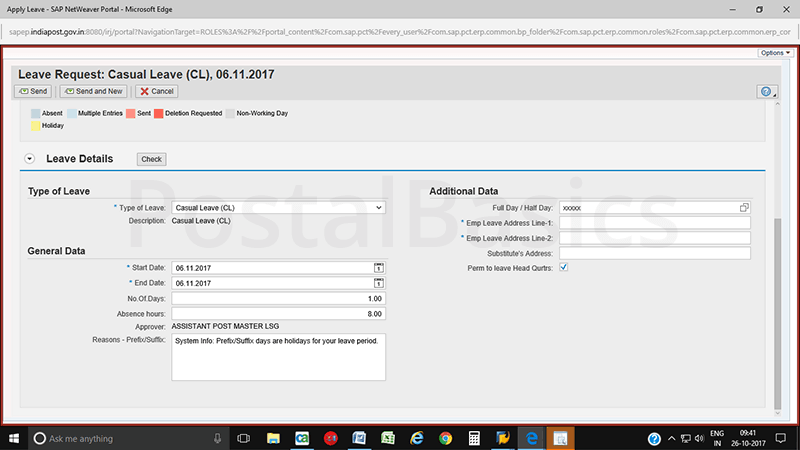 How to Apply Leave in CSI in India Post? 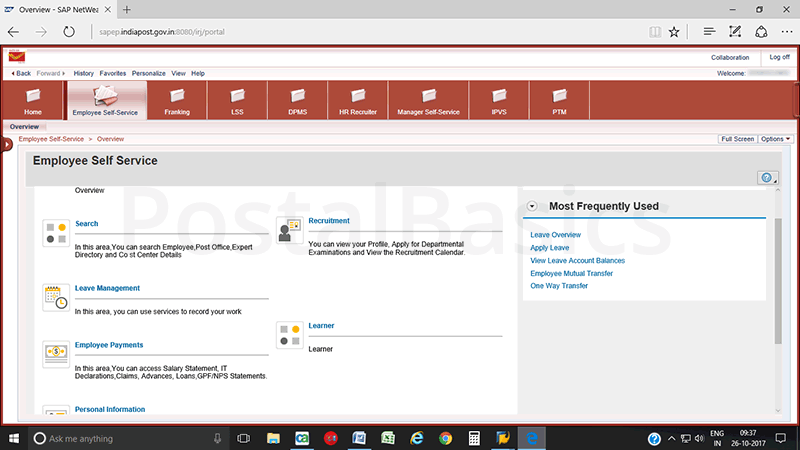 Employees need to apply leave online after introducing CSI in India Post. 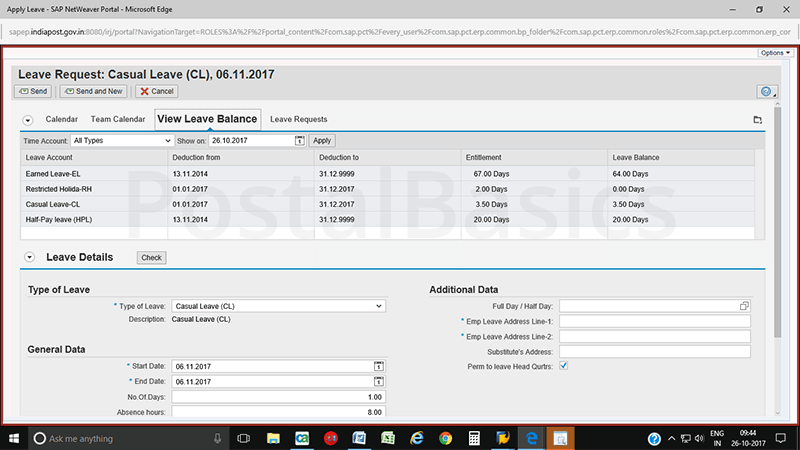 Following are the step by step procedure for applying leave through CSI SAP module. 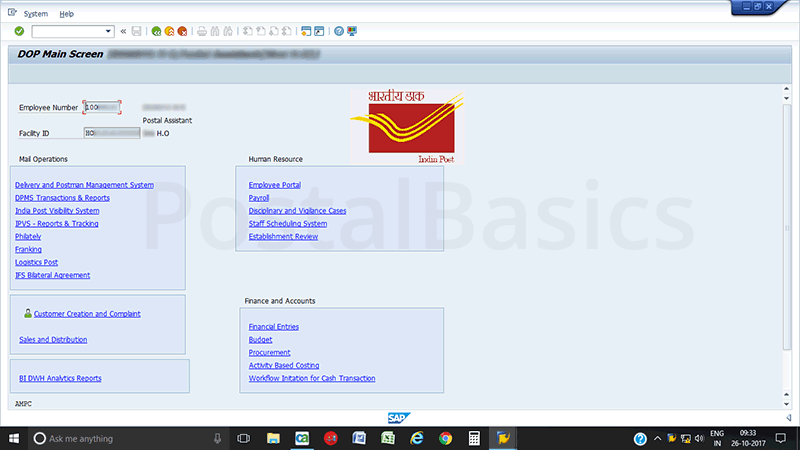 In SAP, go to DOP Main Screen or type the T-code zdop_main. The below window will be shown up. Click on Employee Portal. It will redirect to next page as shown below. 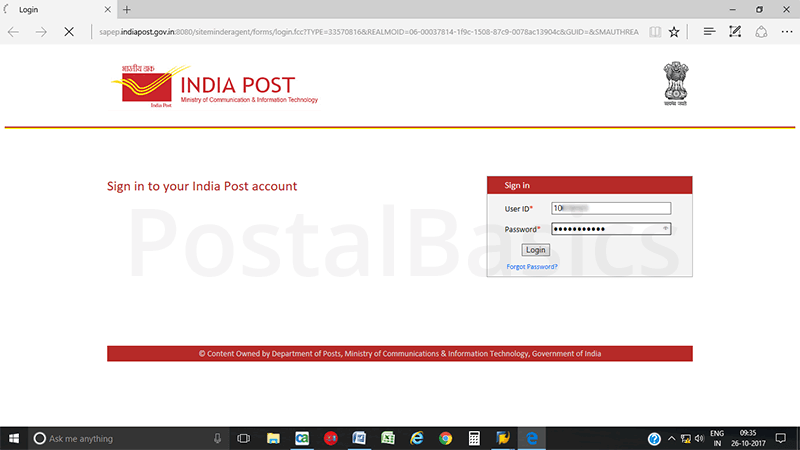 Enter the User ID and Password. Click on Log-on to enter into the page. It has some of the icons at the top of the window like Employee Self Service, Franking, LSS etc. Refer to the screenshot below. Leave management – For Leaves. Employee Payment – For loans, Salary Statements etc. Personal information – Nominee details, Mutual Transfer, HR query, Asset declaration, My Service book etc. 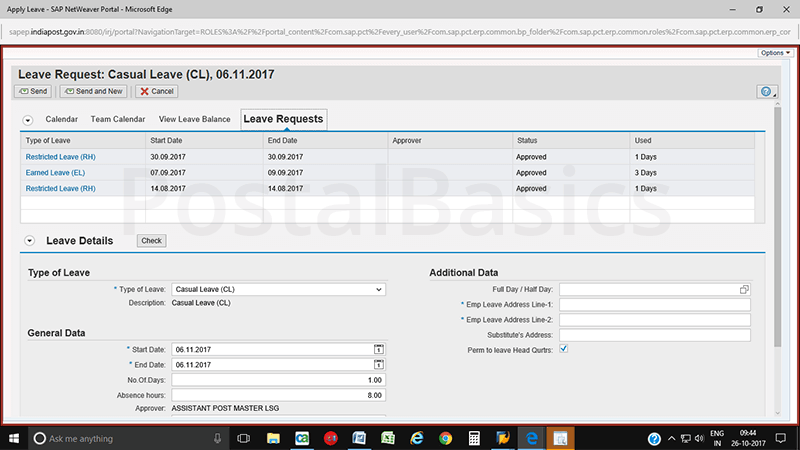 Here click on Leave Management. You will see the below screen. Here, you have the list like, Apply for leave, leave overview, Public Holidays and Restricted Holidays etc. Go to Apply Leave. The below window will show up. 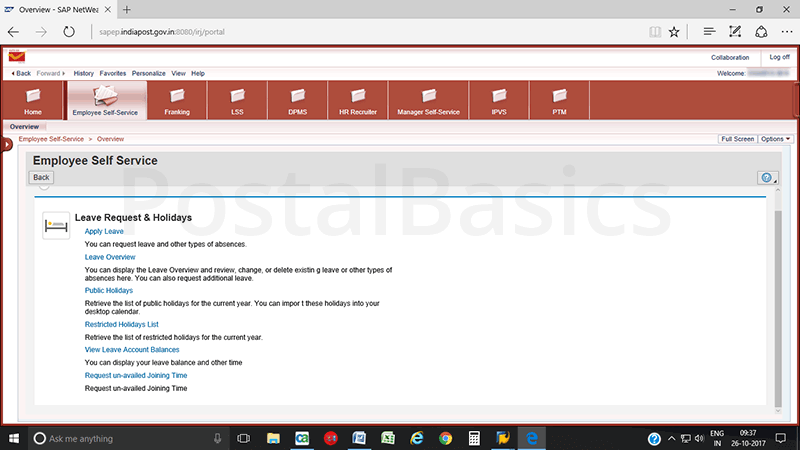 In this page, you have options like, Calendar, Team Calendar, View Leave, Leave Request. 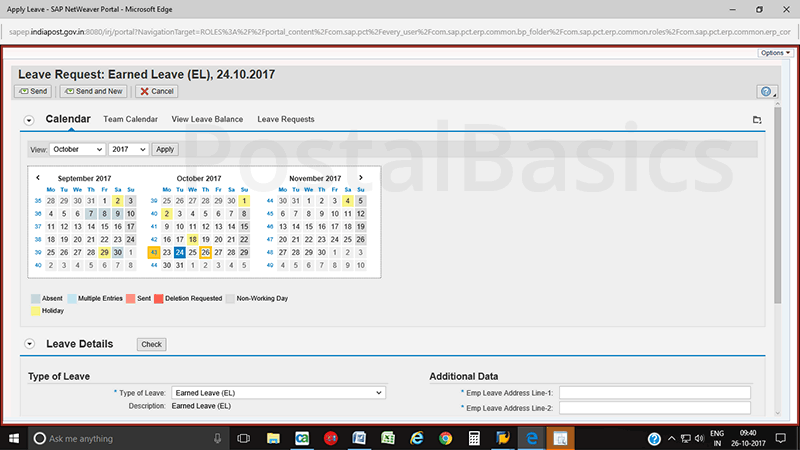 In calendar – all holidays, non-working days, absent days can be identified in different colors. In Team calendar – shows the same details but it includes all staffs details of an office. In Leave balance – you can see the balance of all kind of leaves until today. I’m going to take one example of Casual leave on 6.11.2017. Reason Enter the reason for leave. If you want to take the permission to leave the Head Quarters then click on the checkbox. Once you enter all the details, click on Send button. If it is CL/RH, a message will go to PM/SPM of the same office for approval or else it will go to Divisional Office for approval. You can check whether the applied leave gets approved or rejected by clicking Leave Request as shown below. You can also check the balance by clicking View Leave Balance menu as shown below. © Copy Today 2017 All Rights Reserved.